Just regular folks. : Today is the day! Today is the day that I found out I need to wear glasses. I knew this day was out there somewhere in the future - however, I did not think it was going to be today. Even after Sheila tested me and confirmed that my eyes were not 20/20 and I have known for a while that Jeremy could read signs (with his glasses) that I could not, I went into today's eye exam thinking that I still didn't need glasses. Mid- morning, Vince and I went to our Costco eye doctor appointment. I was sitting through the eye exam when I came to the slow realization that I was not able to read the smallest lines of text and in a sudden moment, I understood that I was not going to get out of getting glasses. 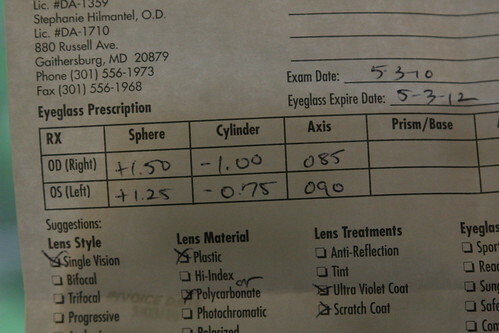 I don't think it's a very strong prescription, but when the doctor rigged up a set of lenses that had this prescription and I looked through them - I felt like I was seeing through my 15-year-old eyes. So clear and my eyes felt so relaxed reading text. What a great invention, glasses. I decided to order this pair. Vince's eyes are fine. They are 30 years younger than mine, so there are a lot fewer miles on them. Then we had some pizza for lunch. 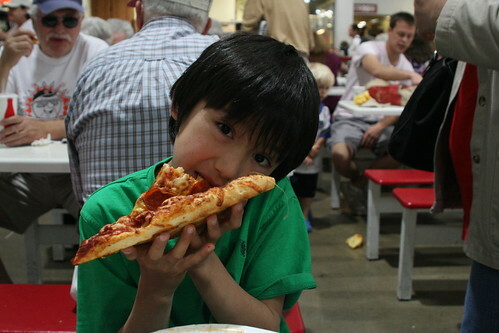 Vince wanted to say that this was the biggest pizza slice ever. Costco. The land of the biggest. The better to see your beautiful eyes with my dear. Love the pix from your parents on their trip!